- What does a solid project teaser looks like? - Which information is relevant to investors? - How should a teaser be structured to facilitate transactions? Based on our  extensive  knowledge  in  financing of renewable energy projects,  we  designed   new teasers for  both  Wind and Solar projects  which  are now available on our platform. The aim of the new  structure  is to  make it simple for asset owners to  provide investors  with relevant information  about their project. A  convincing  project teaser  often  represents,  just  like an appealing  business card, the  starting point  of  fruitful business partnerships. If the information is complete, credible  and up-to-date, the teaser will  allow  quick and  efficient match-making between  the  asset owner  and  suitable investors. For Wind, we  identified  10 crucial  elements  and developed a template for  a  solid  teaser  which has the potential to attract keen investors. Based on our findings, the  new template  is divided  into 10 sections  (Figure 1). The teaser  starts off with an overview of the project development. The purpose  of  this  first section  is to  introduce the investor  to  the project development process, from the inception of the idea to the start of commercial operation. The project development process is contingent upon many external factors. 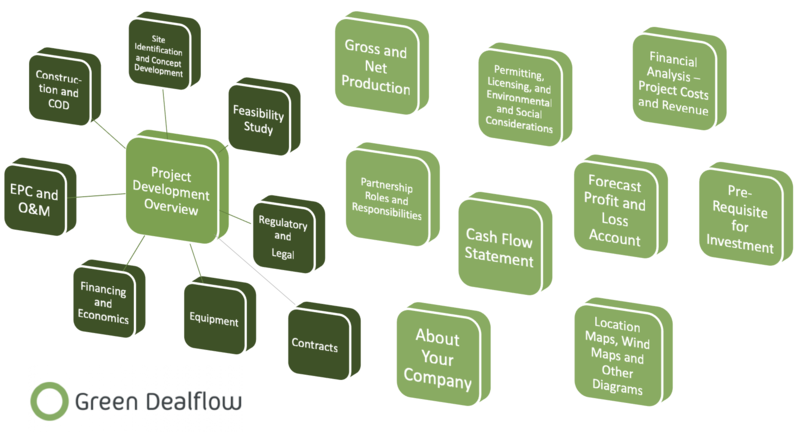 However,  at Green Dealflow, we consider the project development process as certain activities that need to be completed  and  which can broadly be organised in  the  following 8 stages. Site identification and concept development. The first  three parts  of Section  I  are  relevant to  owners of assets  in the Development and Operation stage. The first  consists  of  Site Identification  and  Concept  Development  and  considers local support, grid access, zoning and the overall suitability of the site. The  second  part of  Section I conducts a Feasibility  Study  which assess the proposed design, technology, cost, electrical interconnection, power purchaser load profile, CAPEX, grid connection and possible mitigation factors (e.g. forestation, noise abatement, etc.) as well as the prevailing country standards for maintenance scheduling, overhauls and spares. The third part of Section I takes into consideration Regulatory and Legal aspects such as the right to develop, land use and site control, permitting, environmental compliance and impact, the implementation agreement and the risk management strategy. The  Equipment  and the  Financing/Economics  concern owners of Ready-to-Build  and  Operation  assets. Both parts request  the asset owner to fill in  dates  of  the occurrence of  specific events such as  the finalisation of wind turbines, the consideration of suitability for remote service or of sensitivity to heat and moisture as well as the development and sourcing of budget and funds, the elaboration of the financial structure and the consideration of exit scenarios such as disposition refinancing or transfer. Engineering, Procurement, and Construction (EPC) & Operation and Maintenance (O&M) and Construction and COD  represent the last two parts of  Section I  and are  only  addressed  to  projects that reached the Turn-Key  or  Operation  stage. Section  II  gives an overview  of the  Gross and Net Production. Here,  the asset owner should  aim  to provide the investor with  an  estimated  but realistic amount of  energy outcome over the life time of the  wind  asset. It is crucial to be precise and provide as much information as possible. Section  III  investigates the  Permitting, Licensing, and Environmental and Social Considerations,  in particular if the necessary assessments have been carried out and if all permit applications are completed. The asset owner has to ensure  the compatibility with the national  grid regulations  and  that he obtained the land lease agreement as well as the electricity generation license. In Section  IV, the commercial viability of a wind turbine project is determined through a Financial Analysis that takes into account the expected costs, investment requirements, O&M costs, and revenues. Section  V  explores  Partnership Roles and Responsibilities  and  allocates  different  tasks  to  the developer  or  the investor – from development funding to EPC. In Section VI  and  VII  the asset  owner is asked to  attach  an estimated  Cash  Flow  Statement  and  a  Forecasted  Profit  and  Loss  Account  to  provide interested investors with detailed information on the profitability of the  undertake. The  Pre-Requisite  for  Investment  in Section  VIII  investigates  both  the  object of purchase (e.g. development rights, EPC,  O&M contracts,  etc.) and the cost structure. Section  IX  of the template is reserved for  contributions  about  the asset owner’s  company  and previous experience. Any  information which contributes to the  credibility of  the  project  (e.g. senior management, track record)  is valuable  here. The last section  allows the asset owner  to  include specific  geographical  characteristics of the  asset  into  the teaser  such as locations maps, wind maps, electrical interconnection diagrams, substation diagrams etc. The first impression is crucial, hence it is important to have a high-quality teaser for a project as investors use it to determine whether they will consider investing or not. Green Dealflow’s new teaser templates aim to support asset owners to provide investors with relevant and well-structured information at any time. We hope this will result in less redundant communication, increased transaction efficiency, and give rise to more fruitful business relationships in the renewable energy sector. You can access the new teaser templates after you logged in under >My Account >Teaser Templates or provided you are already logged in by clicking here. If you are not a member yet, create a free account here.